I think it's time to replace some of the electrical and maybe a few other things... — Buda Mill & Grain Co.
We started upgrading the site infrastructure in November, 2014 after working with the civil engineer at Hollingsworth Pack. Here are a few pictures of what the site looked like since everything is underground at this point. First thing to go in was the new wastewater line and manholes , as shown below, for the entire site. Trenching for the 12" water line that will ultimately connect to the Buda water tower. The contractor had to work around the old scale concrete housing to install the 12" water line. Quickly following wastewater, we had 50% of the 12" water line installed. We're still waiting to install the remaining portion once we have permission from the railroad to bore beneath the tracks so we can connect the line with the water tower. As the construction company trenched, they came across the old concrete housing that had held the second scale on the property. Pieces of history keep surfacing. 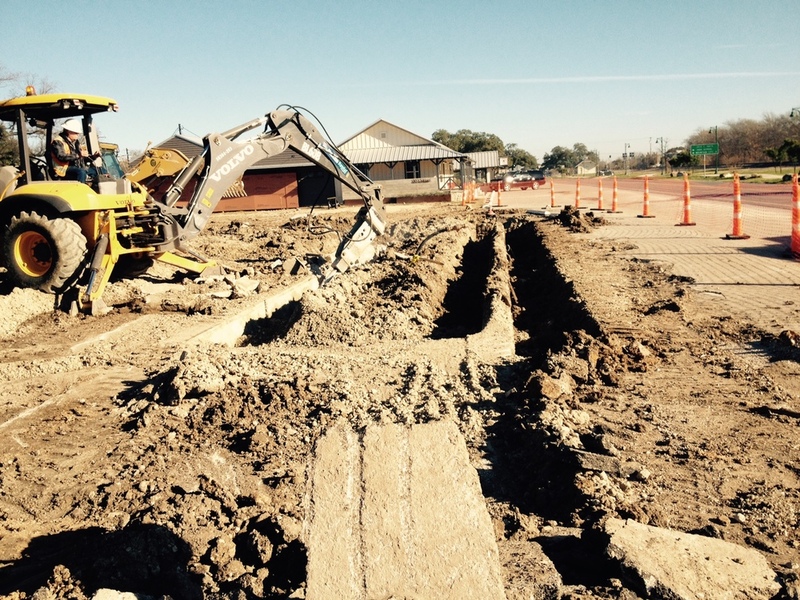 With the wet utilities completed, the contractors started trenching so that all the electric would be placed underground. Now we can finally get rid of all the telephone poles running through the property. When Counterpoint Gas came on the property to install the gas line, having never seen gas pipe installed, I had been expecting large cast iron pipes. Instead a very flexible yellow pipe was unrolled and quickly installed. Finally paving is about to begin. Hopefully everyone has started to notice the changes happening at the Mill. Trenching for the electrical lines by the Doherty House, one of the buildings on the Mill property. Yellow pipe for the gas line through the property.